Give your sweet little one a stuffed toy they’re sure to adore with this Walking Unicorn stuffed animal from Kid Connection. Walmart has Kid Connection 9″ Plush Walking Unicorn for $14.97. Choose in-store pick up to save on shipping charges. 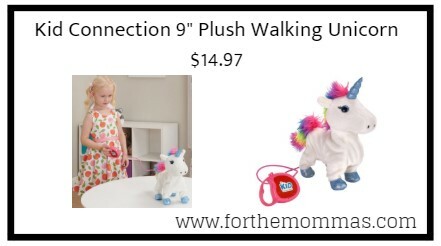 This 9″ unicorn is designed to walk forward and features a pink remote controlled leash that allows your child to walk it like its very own pet. Perfect for the young fantasy or animal lover in your home, this Walking Unicorn boasts a brilliant rainbow mane, gleaming unicorn horn, and pristine white fur. Whether as a cuddly colorful gift for birthday or holidays, or a way to introduce your little one to the idea of a pet, you’re sure to see cheek to cheek smiles on your little one’s face with this toy.